Next photos of finished engine mounted on water sump. Prototype CNC machined water sump was finished. Made from Aluminium block. New 700cc engine was finished. Engine has exhaust up and rotary valve up on same side. New 700cc engine was finished. Engine has exhaust down and rotary valve up. New crank disc for easy instalation of ignition. Crank disc have 20mm shaft and 4mm groove for keyway. New ignition ligthweight plate. 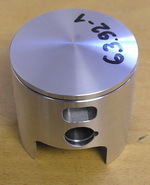 New 700cc forged pistons are available. New 700cc square type cylindercases are available. Rotary valve can be mount from both sides. New cylinder heads are available for new engines. Inserted chambers sealed with o-rings. 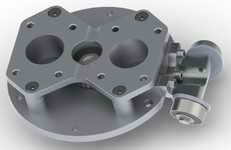 New rotary valve for motorbike Weber IDF40 carburettors are available. Double row bearings are available. Main bearings for crankshafts was added to catalogues. Bearings has polyamid cage and C3 clearence. 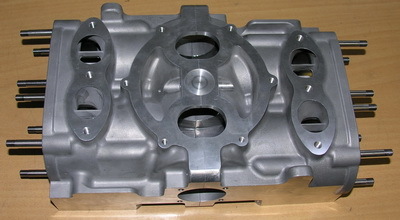 Aluminium forgings for 700cc pistons are available. Forgings are made from 4032 Aluminium alloy with 12%silicone and tempered T6. New ratios 11:16 & 11:17 are available for small gearboxes. Aluminium forgings for 500cc pistons are available. Forgings are made from 4032 Aluminium alloy with 12%silicone and tempered T6. New ratio 12:14 available for Large gearboxes. Big end bearing problem was solved !!! After many years with troubles of big end connecting rod bearings we solved problem with new type bearing. New bearings are machined from solid spring bronze material on CNC machine. Phosphor bronze material has good toughness, strength, good sliding properties. One side of bearing is rounded to fit crank disc radius corner. Bearings were tested on our Dyno tester about 1 hour in full load (about 80L of Methanol). We dismantled crankshaft and all parts look as new. No coloured on hub pins, no wear on shafts and big end conrod bores.